CasesBlog - Medical and Health Blog: What Causes Bad Breath (Halitosis)? Halitosis is a generic term used to describe unpleasant odor emanating from the mouth air and breath, independent of the source where the odor substances originate. It affects between 50 and 65% of the population, but despite its frequency, this problem is often unaccepted and declared as taboo. 90% of patients suffering from halitosis have oral causes. A small, but important percentage, of oral malodor cases have an extra-oral etiology, very often falling into the category of "blood-borne halitosis". Several systemic diseases have been found to provoke malodor or to be a cofactor; bad breath may be an early sign of a serious local or systemic condition. A psychogenic halitosis also exists including the variant "pseudo-halitosis", when the oral malodor does not exist, but the patient believes he or she is suffering severely from it, and the halitophobia, when, instead, there is an exaggerated fear of having halitosis. It is important to determine quickly whether the odor comes from an oral cause or not: if so, it requires referral to a dentist; if not (extra-oral origin alone or combined), its management requires the treatment of the underlying causes. 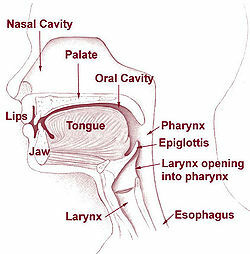 Extra-oral disorders can be the cause in up to 15% of cases. From The WSJ: What really causes bad breath, what can you do to prevent it and can you tell if you have it? WSJ's Heidi Mitchell joins Lunch Break with Tanya Rivero with the answers. Image source: Head and neck. Wikipedia, public domain.